The scale-shifting of the tree trunk makes for quite an interesting design exploration as within the context of this design creation it becomes a design challenge ― where a building must harmoniously inject itself into its dense organic and beautiful texture. 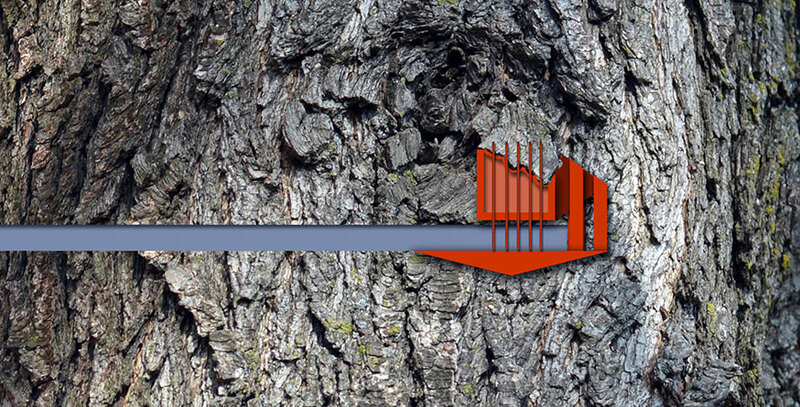 By using the trunk of a tree as terrain (in a photograph), the context is set for creating that first initial design "mark". In this case, Scale Constructs depicts a building (shown in red) with a road (shown in gray) ― where the construct feeds directly from the terrain (all of which are shown in plan). The scale-shifting of the tree trunk makes for quite an interesting design exploration as within the context of this design creation it becomes a design challenge ― where a building must harmoniously inject itself into its dense organic and beautiful texture. This brings up questions of how design intervenes into pre-existing environments where a language is already set. Architectural injection can be quite fascinating when done correctly, as the juxtaposition between the new design language and the older design language makes for an interesting dialogue. How do you use design injection to create awe-inspiring experiences?